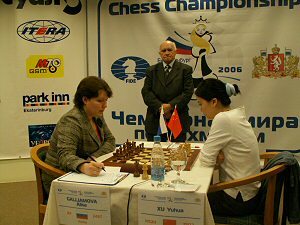 Women's World Chess Championship 2006, Ekaterinburg, Russia: Match keeps its mystery! 24.03.2006 Match keeps its mystery! The Chinese Xu Yuhua is leading 1,5:0,5 in the match against Russian Alisa Galliamova in the WWCC Finals. In the second game Xu Yuhua fixed a draw playing White. The opponents played a Sicilian defense and Galliamova undertook an active Queen counterattack. Later on it caused great complications. The Chinese took the initiative and managed to win a pawn with threats to King, Rook and the weak Queen side. In such an ending Xu had all the chances to advantage. But the closing stage was not that successful for her, her position was shaking, she was bereft of a pawn and a series of accurate moves lead to a draw. Alisa Galliamova got her own impression of the game: “In fact my Queen f4 was quite adventurous, it would have been wiser to move f6, but I wanted to lead my opponent astray and to get non-standard positions. And practically got it…” Finally Alisa Galliamova agreed to take part in our press conference and answer several questions of chess fans and journalists.